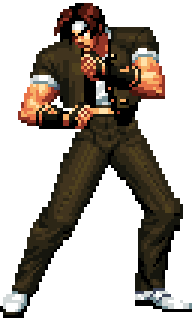 Kyo Kusanagi (草薙 京) is one of the main characters of the King of Fighters series. He is the heir to the Kusanagi clan (members of his clan possess pyrokinetic powers) and the leader of the Hero Team. 660 years ago, the Kusanagi and Yasakani clans were once allies. However, due to the latter's jealousy and hatred over the former's fame, the Yasakani struck a blood pact with Orochi for more power. They renamed their family name to Yagami and their flames, previously red like their former allies, changed to violet from Orochi's taint. Since then, the clans have waged a generation long grudge with casualties made from both sides. It continues in The King of Fighters series with Kyo and Iori Yagami. Shortly after the completion of his training, Kyo competes in a preliminary held in Japan to determine the members of the country's representative team in The King of Fighters '94 tournament. He bests Goro Daimon and Benimaru Nikaido to become the leader of the team, the two becoming his teammates and eventual friends. They reach the finals, where they met the host of the tournament, a powerful fighter named Rugal Bernstein. Rugal boasts his desire to fight powerful opponents and challenges them. After his defeat, he self-destructs his ship in attempt to bring them with him but the team escapes unharmed. In the next tournament, Kyo and his team are invited once again into a tournament organized once again by Rugal, who survived his craft's self-destruction. This time, Rugal also brainwashed Kyo's missing father, Saisyu, into attacking his son. Kyo's father regains his senses after he was subdued by the team. To counter the team's strength, Rugal challenges them with power sapped from Orochi. However, Rugal's body was overwhelmed by the power's immensity and he was vaporized after his defeat. Pleased with his son's prowess, Saisyu leaves unnoticed, insinuating that he entrusts the clan's duty to Kyo. Prior to the events of The King of Fighters '96, a mysterious man -later revealed to be one of the "Four Heavenly Kings" of Orochi, Goenitz- challenges Kyo to a fight. Kyo arrives, powered by his overwhelming confidence in his fists, only to be defeated soundly by his challenger and sent to the hospital. In spite of his injuries, his anger and spirit from his loss drove him to invent powerful new techniques -this is the canon explanation for Kyo trading his ground-fireball attack for his now trademark flame-laced melee attack strings. He enters the year's tournament to prove his strength to his unknown attacker. In the tournament's finals, he meets the host of the tournament and the younger heiress of the Yata clan, Chizuru Kagura. At the tournament's end, he vanquishes Goenitz with Iori and Chizuru's help. Though he is warned by Chizuru of his clan's destiny with Orochi, Kyo ignores her and promptly departs. Before The King of Fighters '97 takes place, he is pestered by fellow high school student, Shingo Yabuki, to teach him how to create his flames. Though annoyed and flustered by his persistence, Kyo partially agrees to mentor him as a means of gaining free meals. He also experiences nightmares of a strange man defeating him at the King of Fighters tournament, but continues to participate. Though it's ambiguous as to which team he enters during the tournament, it is canonly accepted that Kyo joins with Iori and Chizuru for its conclusion. He advances into the finals, where he confronts the remaining "Four Heavenly Kings" of Orochi, Yashiro Nanakase, Shermie, and Chris. When they are beaten, Orochi possesses Chris' body and attempts to destroy the three clans at once. As was done in the legends of their clans, the trio successfully defeat him. In a last-ditch effort, Orochi (manifested in Chris' body) causes Iori to enter the berserk Riot of Blood state, expecting him to turn on Kyo and Chizuru. Instead, Iori snares Orochi by the neck, and Kyo obliged his rival by crippling the great demon with one last deathblow, allowing Chizuru to reseal Orochi.